PART OF Tybee Island’s allure, to both locals and visitors, is its qualities that have withstood the test of time against its potential to become saturated with high-rise condos and chain businesses. With that being said, it is a rare occasion that a new place pops up on Tybee, and in many cases it is a familiar Tybee business that expands its resume. 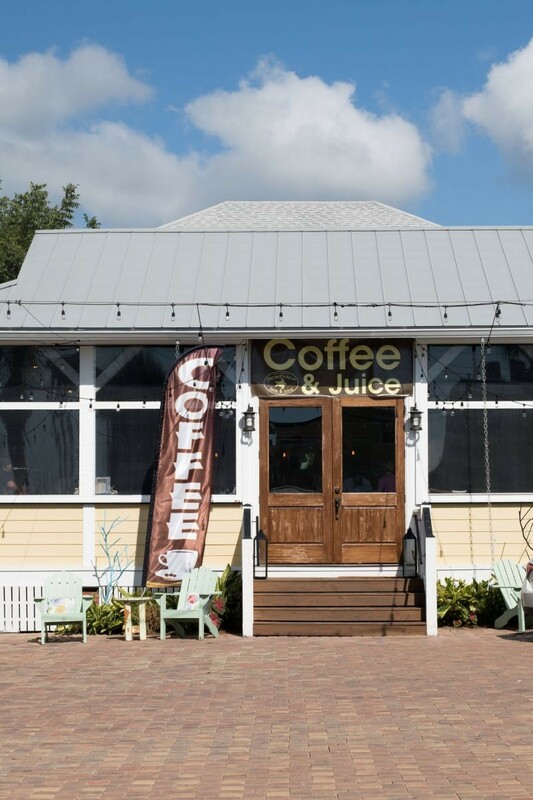 As of this summer, Beachview Bed and Breakfast now falls into that category, opening their very own coffee, juice, and breakfast shop. 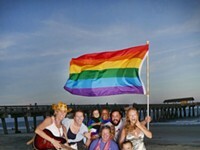 Beachview Bed and Breakfast is located on the south end of the Island, and has been a Tybee staple for some time. Owners Frank and Karen Kelly expanded the bed and breakfast in 2015 by opening a wedding venue next door. After operating the venue for sometime, Frank and Kelly decided to switch gears and focus their energy on coffee and juice—an easy model considering the team’s love of coffee and Karen’s love of juice, Karen tells me. The storefront itself epitomizes Tybee Island—rustic wood walls, a white washed wood ceiling, seashell chandeliers, and wall to wall windows for that beachside airy feeling. Walking in, you immediately take in everything our tourists love about our quaint and rarely-changing Tybee Island. 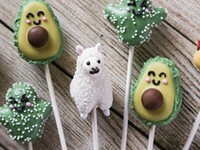 When it comes to the menu, “the entire team spent time researching coffee shops, small cafes, and juice bars, and they just started throwing different items together to come up with their always changing menu,” explains Karen. Let’s start with coffee, which is in my opinion the most important part of any morning. After trying several coffee roasters, Beachview settled on Rev Coffee from Smyrna, Georgia. The flavor of the coffee is smooth and subtle, a great canvas for any sugary or creamy accompaniment that may get stirred in. The “Beachview Turtle is our signature coffee drink and it’s served either hot or cold,” Karen explains. I went for the cold version because the morning I visited was a typical toasty Tybee day. Two shots of fresh brewed espresso are layered in a tall glass with milk, hazelnut syrup, caramel, chocolate, and whipped cream. Turtle could not have been a more fitting name. The drink is sweet, almost tricking the palate into thinking you are drinking a milkshake, but not before your tongue is tickled by the slightly bitter tinge of roasted espresso. The restaurant offers several other specialty coffee drinks, including a caramel macchiato, a white mocha, and something dubbed The Don, which is served with steamed milk and a dark chocolate syrup. For those a little more traditional in their coffee selection, drip coffee or a French press is available. The espresso options are just as plentiful, ranging from an americano to a Cuban, which may be my favorite way to drink espresso. A Cuban is a double shot of espresso served with raw sugar at the bottom. You stir in the hot shot, which creates a warm pungently sweet shot of rich, dark coffee. Equally as delicious is the store’s robust selection of fresh fruit smoothies. Every single ingredient is fresh, which makes the price of only $6 unbelievable. The Berry Chill smoothie was my first choice because the list of ingredients featured every ingredient that is right about summer. Fresh bright blueberries are layered with syrupy sweet pineapple, tangy thick yogurt, and refreshing coconut water. 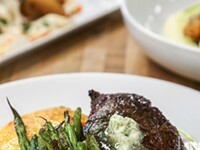 The emulsion is almost too beautiful to drink, and goes down quickly due to the balanced yet quenching and light flavor. 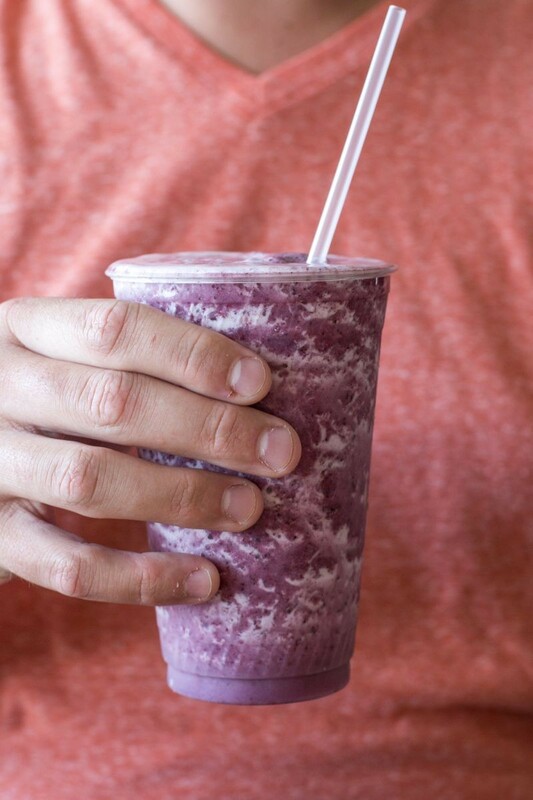 The Blueberry Kiwi smoothie also features blueberries, but has the addition of kiwi, almond milk, and honey—extremely unique pairings that give the smoothie a heartier and creamier texture and taste. On the healthier side, although I am not sure you can get much more beneficial than what is already offered, is the Mango Kale Smoothie. The lightest of them all, the Skinny, is blended with cucumber, spinach, mint, and orange juice -- a smoothie that would be easy to drink beachside bearing the summer warmth. You read that right: The menu includes fresh moist baked breakfast treats ranging from muffins to French toast. It is easily the most unique item offered at the quaint restaurant. Served in its own individual dish, shredded hash browns, eggs, and ham are baked together, which are essentially all of my favorite breakfast ingredients. You will find little salty bites of ham floating amongst tender and fluffy eggs, and the bottom adds a bit of texture with crispy hashbrowns. “Our Swiss Eggs have been a been a Beachview Bed and Breakfast favorite and has quickly become a Java Juice favorite as well,” Karen boasts. Like the Nest, this breakfast dish is prepared and served in its own individualized dish and is created with a combination of breakfast meat, cheese, and eggs. On the more classic side of bed and breakfast food offerings is the Oscar Quiche, but the preparation is in no way classic. 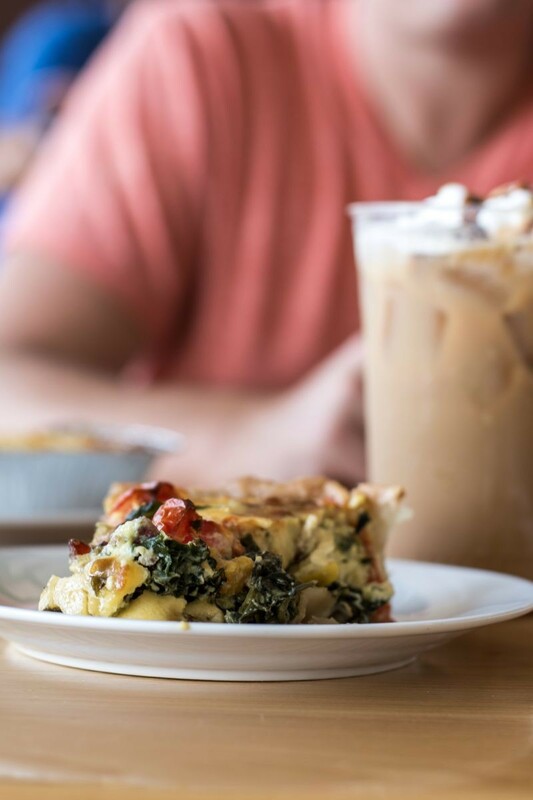 The order comes as a single slice of cloud-like egg quiche; floating amongst the robust wedge is a bounty of wilted vegetables of spinach, carrots, peppers, onions, and more. As to be expected, the bottom is a tender flaky pastry crust that is buttery without being soggy. The bold quantity of ingredients is what makes this version far from classic.